During the past week, Archaeovision members James Miles and Hembo Pagi, gave a number of talks in Tallinn, Estonia on the research that Archaeovision is able to provide. On the first day, James presented a paper at the “Creating the Magic: Matching Culture and ICT” eCult Dialogue Day at the Art Museum of Estonia. The eCult day was organised in collaboration with the EMYA – European Museum of the Year Award event with several high profile museums in attendance. 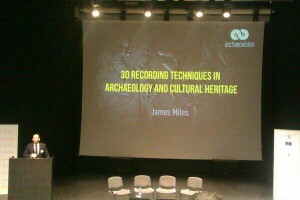 James’ paper highlighted the 3D recording aspects that Archaeovision is able to provide within archaeology and cultural heritage. It touched upon the research developments that Archaeovision R&D are making within virtual museum displays and further discussed the potential that laser scanning and RTI have when published online for public dissemination. 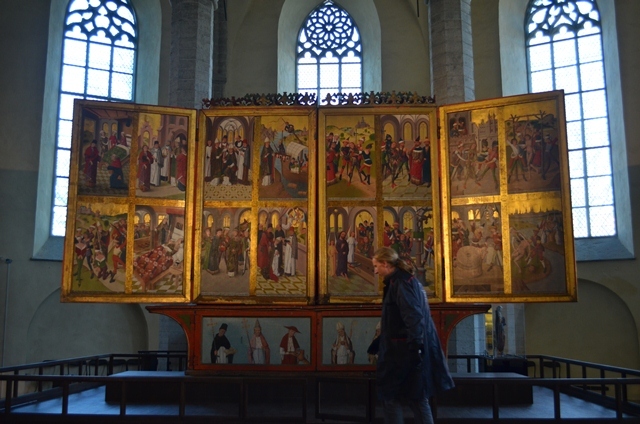 Hembo also presented at the eCult dialogue day presenting his work on the St Nicholas’ Church altarpiece which he has completed in collaboration with Dr Hilkka Hiiop through his role with the ACRG at the University of Southampton. Our second and third day were spent at the at the Rode Imaging Event which was organised by Hembo, Dr Hilkka Hiiop and Andres Uueni. 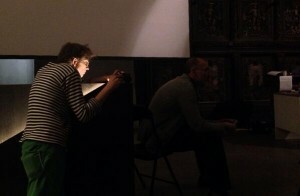 The event was attended by experts in the field of digital recording and imaging, software developers and conservators. James and Hembo both gave papers on the first day of the event. 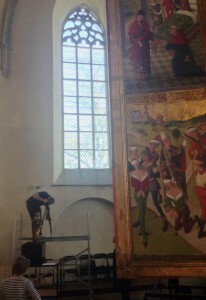 Hembo gave a presentation on the imaging work that has been completed on the St Nicholas’ Church altarpiece and James gave a paper on his photogrammetry and RTI work on the Hoa Hakananai’a statue. The papers were meant more to introduce the techniques to the conservators and generate interest in their application within their field of expertise. This was followed by the second day where we presented various techniques through a series of workshops where we discussed the best practice of collecting data and how best it could be used within their studies. The second day was attended by a number of local students and it is hoped that the event will inspire others to begin using the techniques shown. The Rode imaging event was not only a seminar and workshop but it evolved into an organised two day Hackathon supported by Martin Verrev, Hembo and Vahur Puik. The event allowed for the recording experts, software developers and conservators to work together to create applications or software that met the needs of the experts. A number of ideas were put forward which allowed the developers to say how easy it would be to complete. Two main ideas were chosen, the first was a way to combine a multitude of recording techniques within one model and the second focussed on developing a new RTIbuilder. More on this will be discussed in a blog post that we will link to later. The development of the RTI discussions can be seen here and was written by Dr Graeme Earl of the ACRG.